We have chosen the everinstagrammable LIMS building (La Trobe Insititure of Molecular Science) as our front cover. This building, designed by Lyons Architects, is plastered across stories on a sunny day and home to some of the world’s leading researchers. If you would like to be a part of future cover designs, we would love to hear from you. Get in touch! Like all great student publications, we are dependent on student contributions. If you have anything you’d like shared, you can find our socials on the contents page and hit us up. We will try our very best to accommodate any submissions. If you would like to submit to Rabelais, not only will you be paid in high-fives and be the envy of your whole block, you have the chance for your work to be seen by up to 36,000 students across the Victorian La Trobe campuses. We also have a new and improved online presence which will allow you to share you and your fellow La Trobians content online. Thanks for reading. Enjoy Rabelais 2019! In this edition, we have the one-stop-shop for all your orientation needs, a clubs and societies guide, an introduction from our office bearers, a coffee guide around campus (heavily debated), student budgeting tips and much more. Our goal as a student publication is to provide all students with an outlet for their creative content. We, in a way, are an ice cold glass ready to be filled with your creative juices and consumed by the avid readers of the ever-flourishing Rabelais magazine. Hello and welcome to the first edition of the Rabelais student magazine for 2019, the Orientation Week edition! We here at the LTSU are tremendously excited for the year ahead and hope students new and old will have a blast at the clubs and societies festival across campus. EVENTS CALENDAR What’s going on around here? ANXIETY Sip the tea, kill your shyness, become confident. A FEW DRINKS, A BIKE RACK & A METAL PLATE An injury created a new, smarter saver. 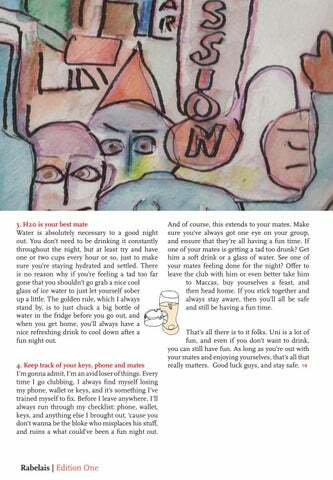 A RESPONSIBLE GUIDE TO RESPONSIBLE DRINKING Be a friend, but still enjoy your night. LTSU OFFICE BEARERS Who’s doing what? BE A BETTER HUMAN A look into the newest campaign of 2019. THE ARCADE A couple of things to keep you busy. CONTRIBUTORS See who helped make this edition great. access our Career Ready program, which will help you build a portfolio of skills and attributes sought by employers while you study. RABE On behalf of everyone here at the University, welcome to La Trobe. You’ve made the right choice to study at a university that is committed to giving you every opportunity to learn and succeed so that you can have the best possible start to your career. La Trobe is Victoria’s third oldest University, and since opening our doors in 1967 we’ve provided a pathway to success to people from all walks of life. With a dual emphasis on excellence and inclusivity, we put our students at the centre of everything we do, and we’re delighted that you are following in the footsteps of 200,000 La Trobe alumni who have gone on to make a difference in so many different ways. L E T T E R F R O M T H E LT S U P R E S I D E N T 0 Welcome to 2019, La Trobe University! If you’re a new student, get ready for the most amazing few years of your life and if you’re a returning student, welcome back! In 2019, the LTSU will be throwing parties, organising clubs and societies events and feeding the good folk of La Trobe University, but that’s not all. Did you know that we also provide essential services to your university life - such as advocacy, financial counselling and legal aid services? These are free to all students! You can find all of these services in the LTSU offices on Level 2 of the Agora. We understand that your journey through your studies can be a complicated and (sometimes) bumpy journey, that’s why we’re here to help as much as we can! ELAIS My name is Abood Shehada and I am honored to be your La Trobe University Student Union President for 2019. First and foremost, I would like to acknowledge the traditional owners of the lands that the La Trobe University Student Union operates within: to the Wurundjeri, Latjie Latjie, Barkindji and Yorta Yorta peoples. I would also like to acknowledge that the lands on which each campus is built is on are Aboriginal lands, whose people’s sovereignty was never ceded; and pay my respects to their elders past and present. I’m super excited for the year we have ahead and by the time you’re reading this, it has already begun with Orientation Week! Orientation week is a week where you can join some of our 90+ clubs and societies, sign up to volunteer in the LTSU and get involved in the incredible and diverse community we have at La Trobe. The clubs and societies provide an opportunity to meet likeminded people and make valuable connections on campus. It is important to acknowledge the incredible work put in by the staff, volunteers, OB’s and clubs and societies for this week. Something we’re embracing this year is the #BeABetterHuman campaign, started by Flinders University, which focuses on precisely that: being a better human. We believe that everybody should feel safe at university no matter what and that these years of your life should be remembered positively. My friend and your General Secretary Annabelle has written extensively on this topic later in this edition. As per usual, the LTSU has started providing our weekly services to students, including; a Chill Out Trolley every Monday in the library, a BBQ every Tuesday and breakfast every Wednesday in the Agora - ALL FOR FREE! So, make sure to come along and grab some free food! If you have any questions, queries or want to get involved with the LTSU, you can speak to any one of us - we’re the people in the bright purple t-shirts around campus; or feel free to get in touch with me at anytime! I’m always up for a coffee (I can never have enough of those)! Looking for a decent cup of coffee and not sure where to start? La Trobe has a variety of options and perhaps this guide can help guide you along the way? You’ve just got off the bus to uni. It’s 8am, and you’ve got your first lecture in 15 minutes. 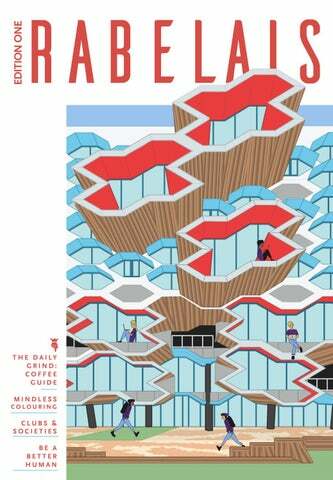 Looking around the Agora, you try and make the hardest decision of your day“Where the hell am I gonna get my coffee?” To solve this incredible problem that you face on a daily basis, the Rabelais team has tried every brekkie spot on campus, and has a decisive guide for you coffee lovers. BAKE ‘N’ BEAN Next to convenience store Looking to spend as little money as possible, but still have a great start to your day? At this little shop, you can grab two donuts and a regular coffee for the small price of $3.50, which can be a great start to any students day. Grab a pie, sausage roll, bagel or any other baked good, and when combined with a coffee, you’re getting great bang for your buck. GRAFALI’S Between Therapy and Fuel If you’re looking for a place where your friendly server will remember both your regular order and your name, head to this small and casual coffee joint below the Agora stairs. You can pick up a variety of brekkie or lunch combos that are some of the cheapest and most delicious on campus, including some great artisanal sandwiches, delicious brekkie rolls, and of course, a great cuppa. If you grab a loyalty card, you can get your ninth coffee for free! this large and open area. Ag and asked some students their daily brekkie choices. You’ve been studying in the library for 5 hours and need to refill your body with sweet sweet caffeine. Downstairs, Writer’s Block provides a warm and comfy atmosphere and a delicious cup of coffee to make your early morning study sesh a little bit more tolerable. If you ever have a meeting with a study group or a tutor, or maybe just want to try some smashed avo on toast, head to Writer’s Block to satisfy your boujee cravings. HOUSE OF CARDS Thomas Cherry Building Looking to buy a nice coffee, but also save the world? House of Cards distinguishes itself from the crowd by giving a random card to every person who purchases an item at their shop. As you recieve your coffee order, chuck your card into the slot of one of four charities beside the store and a percentage of the companies profits will donated to the most popular of these causes. o it began with a few drinks, a bike rack and a metal plate with 8 screws in my ankle. On top of studying IR during the semester, I work casual retail on the weekends. And look, if I’m completely honest, my weekend shifts were dwindling dangerously close to oblivion before I did a number on my ankle. First thing I did when the docs confirmed my ankle was fractured was message my manager a picture of my swollen ankles (yes plural, I badly sprained the other one) and explained I’d have to give up that sweet sweet Boxing Day Pay which meant roughly $300-500 less to me. Now, an unfortunate sequence of events also meant my car rego and insurance were due, I had a library fine, medication costs coming out of my ears, wheelchair rent to pay, I needed to buy my parking permit for the year (thanks La Trobe) and I wouldn’t be back working retail for nearly three months. All of these bills to pay and my account was overdrawn by $84, yay! With 6 weeks of no walking up my sleeve, I began the process of simplifying my financial situation and paying my dues. purchased their forever homes. Not to mention it’s just really wholesome, supportive and pure content. enough in savings to pay for any cracked phone screen (or just fork out $10 for a tempered glass screen protector on EBay). 8. “Read” Audiobooks When you sign up to Audible, you’ll get one free book, use that for The Barefoot Investor or whatever you fancy. Then when you’ve listened to this, go to cancel your subscription and enter that you’re cancelling coz you can’t afford it. They’ll offer you another free book to stay! You’re welcome. 21. Make use of the services at uni Whether it’s FREE financial counselling, legal services or advocacy from the student union or UNLIMITED and FREE counselling for your mental health. Trust me, this will save you from stress cutting bangs, failing subjects and hefty fees seeing professionals outside of uni. 27. You’re a student, flaunt it Treat your student ID card like your phone and TAKE. IT. EVERYWHERE! Flaunt it, flash it everywhere and ask if you can get a student discount. This especially applies if you’re on campus as an LTSU member or over at Kingsbury Mc Donald’s. 22. Apply for financial aid This is a once per year emergency sum in cash of up to $200 from the University when you’re in need. You just need to print the form off online and then go see them for a drop-in sesh at Ask La Trobe. 28. You have TWO guanteed FREE MEALS PER WEEK One great thing about uni every week is that there’s tonnes of free stuff for you to cop. Provided by the Student Union during semester in the agora is a free BBQ Lunch on Tuesdays at 12pm. Halal Chicken sausages, Halal Beef sausages, veggie patties, vegan patties, sliced bread and onions are offered free of charge to all students! Then, every Wednesday morning at 9am there is a free Breakfast, with toast, cereal, coffee, tea, milk and of course, the occasional donut or pancake. Come say hi to us on these services if you have a chance! 23. Put a money jar next to your bed Don’t spend any coins, just empty them into the jar each day. Last year, I cashed in my jar and had $286 saved up in gold and silver $$$$ 24. Download the browser plug-in Honey This is a great app for online shopping, it works mostly on US sites but still works on some Aussie ones too, and what’s the harm in trying right? Basically, it automatically detects whether there are any vouchers or coupons which might apply to your purchase and finds the ones which will save you the most money, delivery and shipping included. Sometimes you’re lucky, sometimes you’re not. 25. Follow some Market Research companies On Facebook, set your “following” settings to “see first” on communities focused around finance and money saving. This way when people post about opportunities, you’ll see them first. E.g “Melbourne CBD, Males 18-25 who play sport. 1 hr face to face interview $80 between 20th and 23rd March. Fill out eligibility survey below”. Again, sometimes you could be selected and get lucky. I wouldn’t mind getting paid anywhere between $50-$200 for an hours work, wouldn’t you? 26. Set and reminder in your phone and actually bring your keep cup to uni You probably own one, maybe even an LTSU one from 2018 like me, or one of those sick Life Apparel keep-cups which feature First Nations artwork and are Australian made. Most of the cool coffee places at uni now offer discounts if you bring your keep-cup, so take advantage of it! 29. Download Groupon Even if you browse every now and then, only buy what you need. For example, my car is well overdue for a service and there was $29 car service offer on Groupon for a mechanic in Essendon. I’m willing to make the trip over to that side of town for such a huge saving personally! 30. Take advantage of your union No matter where you work, no matter what you do, you should be a part of your union. Apart from the fact union members out-earn non-union members, most good unions also provide discounts and incentives for their members. For example, I received a discount book in the mail and I immediately flipped through it and marked down all the two for the price of one deals I was interested in and restaurants I liked that I could get discounts at. Might as well use your perks! And make sure you’re not being ripped off. Call your union and check that your pay and work conditions are up to scratch. You might be having trouble saving because you’ve got a dodgy boss who’s underpaying you. This is what your union is for. 31. Make sure your Medicare details are up to date There are thousands of dollars currently being held by Medicare due to the amount of peoplewith incorrect bank details on their account. Make sure your details are up to date online. It’ll take you 2mins max! The average amount being held per customer is $150. 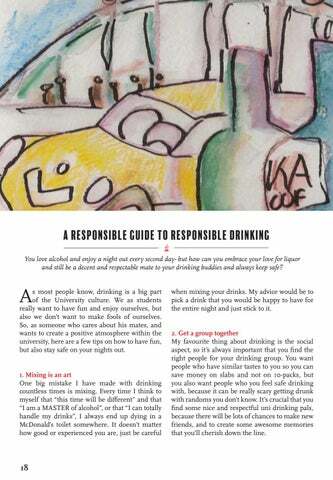 A RESPONSIBLE GUIDE TO RESPONSIBLE drinking v You love alcohol and enjoy a night out every second day- but how can you embrace your love for liquor and still be a decent and respectable mate to your drinking buddies and always keep safe? when mixing your drinks. My advice would be to pick a drink that you would be happy to have for the entire night and just stick to it. 2. Get a group together My favourite thing about drinking is the social aspect, so it’s always important that you find the right people for your drinking group. You want people who have similar tastes to you so you can save money on slabs and not on 10-packs, but you also want people who you feel safe drinking with, because it can be really scary getting drunk with randoms you don’t know. It’s crucial that you find some nice and respectful uni drinking pals, because there will be lots of chances to make new friends, and to create some awesome memories that you’ll cherish down the line. 3. H20 is your best mate Water is absolutely necessary to a good night out. You don’t need to be drinking it constantly throughout the night, but at least try and have one or two cups every hour or so, just to make sure you’re staying hydrated and settled. There is no reason why if you’re feeling a tad too far gone that you shouldn’t go grab a nice cool glass of ice water to just let yourself sober up a little. The golden rule, which I always stand by, is to just chuck a big bottle of water in the fridge before you go out, and when you get home, you’ll always have a nice refreshing drink to cool down after a fun night out. 4. Keep track of your keys, phone and mates I’m gonna admit, I’m an avid loser of things. Every time I go clubbing, I always find myself losing my phone, wallet or keys, and it’s something I’ve trained myself to fix. Before I leave anywhere, I’ll always run through my checklist: phone, wallet, keys, and anything else I brought out, ‘cause you don’t wanna be the bloke who misplaces his stuff, and ruins a what could’ve been a fun night out. Howdy folks, I’m Annabelle and I’m your General Secretary for 2019. This year’s gonna be jam packed with a whole bunch of stuff Starting with the Be a Better Human campaign. You’ll see a lot of promo around it in the first couple weeks of uni and a big showcase in Week Five! ASTRIL ANDRADES & SARAH SAEED GEORGIE AIDONOPOULOS & YANKEE LYU ACTIVITIES OFFICERS WOMEN’S OFFICERS Every Woman at La Trobe is a Super Woman! We are 2019 Women’s Officers; it’s such a privilege to represent the women studying at La Trobe University, Bundoora. We both are passionate about issues like sexual assault, violence, and discrimination. We strongly believe that every girl has a right to be treated fairly, to be educated, to earn a fair and equal wage and a voice to make decisions. For 2019, we have a set few major goals in making La Trobe a safe and prospering environment or everyone living on and off campus. Do you all know, there is a Women’s Lounge on campus? Checkout the Union building! Creating awareness by running campaigns, providing knowledge about facilities like SpeakUp, Counselling services and Women’s Officers on campus are our primary goals. Also, some of our other goals would be more lighting on campus, especially in car parks and paths to university accommodation, providing after hours security and self-defense classes. Thank you all who said ‘yes’ to both of us. We’ll do our best to make 2019 a memorable one for everyone. Hey guys, we’re Liam and Paige, and we’re your 2019 Education & Public Affairs Officers. If you recognize our faces, you’ve probably seen us on one of the several services offered by the LTSU like the free BBQ or Breakfast. This year, it’s our goal to ensure that every student at La Trobe is supported and aware of their rights here on campus, and we’ve got a bunch of great initiatives this year that we can’t wait for you to see. Hello, we are Nishant and Nisar and Hello, we are Abdul and Navneet and we are your 2019 Ethnocultural we are your 2019 City Campus Officers in the LTSU. Officers in the LTSU. We are here to help all students come together and provide a chance to develop their skills in order to prepare them for the future. This year, we’re bringing activities ranging from academia to parties, and to make the City Campus as exciting as the Bundoora Campus. So get geared up for networking events, club events, themed food days, chillout trolleys, bar crawls, and many more. Stay tuned, we’re going to make the City Campus one of the best places to be. To list these initiatives off: We offer a revamped Chill Out Trolley, are working on a campaign around Hurdle Tasks, free student tutoring in your subjects, popup Doggo Days, a winter soup kitchen, and a wellbeing survey into the colleges. ltsu.citycampus@latrobe.edu.au The space here is way too small to describe what services we are keen to offer, so later on in this edition you can check out a larger summary of what we’ll be offering in 2019. Can’t wait to see you all! We have noticed and personally experienced (being international students) that people who come from different ethnic backgrounds tend to stick to their own community, when they should be exploring different cultures. La Trobe University is so diverse, we want to break the barriers by organising ice breaking activities and events. This year, we will be focusing on bridging that gap and help people make new friends by learning about and celebrating diverse cultures present at La Trobe. We plan to work with different ethnic student societies to achieve this goal. ALEX LEIGHTON AND MIKE ZHAO DISABILITIES OFFICERS Hi everyone! We’re Alex and Mike and we are your 2019 Disabilities officers with the LTSU! We are both so happy to be in such an amazing role with so many great things in stall! We have so much planned for the year ahead of things we want to do, beginning with making the disabilities department more visible for students and to bring awareness to so many disabilities that get overlooked. We are striving to set the foundations and to make sure that the university is the most accessible it can be and to help any and all students who need help with their disabilities, physical, mental, impairment or otherwise! We are looking so forward to this year and are always a phone call or an email away. We can’t wait to get this year started! Hello, my name is Andrew, Hey dudes, my name’s and I am the Education Jack. Some people may know me as Sack or Jonah Vice President for 2019. Hill- I’m cool with either. As the 2019 Vice President, I’m running the Welfare I will help in ensuring you Department this year with one clear goal- Eats, Beats succeed while you study and Treats, which has here at La Trobe. I will become the motto of my aim for all students to have department. a great and memorable experience I’ll be doing a free BBQ every Tuesday, so come Hope 2019 is a great year along and grab a snag, I for everyone and enjoy once worked a Bunnings BBQ so you know it’s your time at La Trobe. going to be just slightly above average. I’ll also ltsu_educationvp@ be doing a free Breakfast latrobe.edu.au service on the Wednesday after, where you can grab a warm cup of coffee and a piece of toast, and maybe even the occasional donut or pancake. I’m going to run a few sick events this year so be on the look out for those. Overall it’s gonna be a grouse year and I hope you guys are keen to see what kind of things we have in store for you guys this year! elcome, and congratulations on starting your University journey. I know starting university can be a daunting experience, but don’t fret, I’m here to give you some tips and tricks which will help your survive our wonderful campus here at Shepparton. O-Week is probably the most valuable event that is specifically catered for new students- it not only provides you with all the information you need about our campus and your course, it is also a great way for you to meet your peers and lecturers in a fun and stress free environment. The most important thing to remember is that all the information you recieve will be useful to you at some point, and we in the SSA will guide you through your day and make sure get the most out of your uni experience. If you do miss anything, or if you get an information overload (it happens to all of us), don’t worry- the Shepparton Campus has a team of students and staff members with various experiences and disciplines to help you with anything you need. One example is the Connect Team, with Connect leaders and volunteers who exist solely to help you transistion into uni. You will meet them during Orientation and you can always easily find one. Just look out for people wearing the ‘Connect’ shirts. They will coordinate peer-to-peer activities, support student needs, help your navigate your way around campus, and much, much more. We share the library with Go TAFE, and the friendly staff there will help you find any book you need for your studies or personal interests. The Peer Learning Advisors- or PLA’s- are also a great team made up of students in their second, third, or forth years. There is a PLA for all the respective courses, ready to help with your study and assessment needs, and having already survived first year, they are a great resource for you to use. We also have the Accomodation Services, the Career Ready Advantage Program, fiancial assistance, Indigenous student support, International Student Support, IT Support, Student Wellbeing, and new Student Support Services, that are always available to help all students with anything you might need to help you succeed in University. If you’re still feeling a little lost or confused about anything and you just feel like having a chat, you’re always welcome to come find an SSA member (we wear purple lanyards); we’re always happy to have a chat about anything! You want to be a part of our committee or suggest ideas for activities or events? Come right through! There’s also always a comfortable place to chill out and collect your thoughts if you feel like being alone for a minute. Grab a coffee or a bit to eat at our beautfiul cafe, ‘Food to the Max’, come along to our student BBQs, or browse through our brand new book exchange bookshelf in our student nook. There’s always something for everyone. Even though Shepparton is one of the smallest La Trobe campuses, it still offers the great advantage of close student and staff relations and a real communal environment. We want you to feel that you are part of the University family. If you ever need anything, there is always a friendly face to talk to! that, we have the opportunity to network through social events with community members and potential employers which prepares us for the real world after graduating. Further to my role as a Vice president, I am also a Peer Learning Advisor and a Student Facilitator. MSA CORNER J The Mildura Students Association is study body which aims to create a positive and friendly learning environment and social network for all students. We’ve been busy planning the year ahead and we are so excited for 2019. Yasmeen Khurshid President Yas is incredibly scared of spiders. Sarah Taha Vice President Sarah is a HUGE Harry Potter fan and a proud member of Hufflepuff House! Sarah Hobson Secretary Sarah is a passionate runner. Last year she run the Gold Coast Marathon! Jamuna Jackson Womenâ&#x20AC;&#x2122;s Officer Jamuna loves to cook and try new recipes in her spare time. Bavani Palakrishnan Ethno-Cultural Officer Bavani loves a challenge, unless it has anything to do withreptiles! Tayla Muir Indigenous Officer Tayla loves to laugh and she is effortlessly funny! Camille France Ethno-Cultural Officer Camille loves to read and watch movies! Brody Tanner Member Brody is a great chess player. He has played in four inter-school chess finals! Jemma Jo Johnson Rainbow Offcier Jemma has an oddity collection which includes cruelty-free taxidermy, human bellybuttons and an 11-million-year old dinosaur tooth! Rosina Byrne Support Officer Rosina is an advocate, an artist and a nurturer. She loves her family and her pets. Rosina supports ALL students on campus. You can find her office at the end of the portable building, up the ramp with an MSA flag outside her door. Rosinaâ&#x20AC;&#x2122;s workdays are: Tuesday, Wednesday and Thursday. The LTSU Advocacy Team offers support to students that may be experiencing difficulties or struggles during their studies at university. These problems could be related to anything, be them academic or welfare issues. The team listens to your issues and gives you advice on how to best work through what youâ&#x20AC;&#x2122;re facing- assisiting you in reaching a formal outcome to the issue at hand. 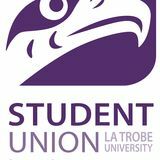 Whether youâ&#x20AC;&#x2122;ve got an Unsatisfactory Progress Committee meeting or need a Remission of Debt, the La Trobe Student Union Advocacy service is always there, free of charge and with complete confidentiality, to help you through the case. Advocacy services are available to students from Mondays to Fridays. Is it your first time away from home and youâ&#x20AC;&#x2122;re struggling with your finances? Or maybe a new International Student going through financial difficulties? Perhaps you just need some general advice around how to plan your money whilst studying full time? The Student Union offers free, non-judgemental and fully qualified financial counselling services and advice to all students at La Trobe University. The service is happy to listen to your issues, and give you any advice you may need; whether that be in setting up a budgeting plan or assisting with applying for an emergency loan. Our counsellors are available for both face-to-face consultations and phone calls on Mondays and Fridays. In times of strife, there is always somebody willing and able to help. Take down these key contacts for when you’re in need. The La Trobe Student Union also offers a high quality, free and confidential legal service through its partnership with Banyule Community Health. Whether you have a dispute with your landlord, are concerned about your treatment in your workplace, or even something as small as a parking fine, qualified lawyers can address your concerns and help with coming to a formal outcome with your case. Currently, the legal service is open at the La Trobe Student Union on Mondays and Tuesdays, with ‘drop-in’ sessions being offered on Wednesday mornings from 9.30 - 12.30pm at the LTSU Offices. The Student Union and La Trobe University also provide an Emergency Housing Service, which can provide students with an one stop shop package of clothing, food, emergency contacts and housing for students in need. If you are in need of emergency housing and are suffering through financial hardships, the Student Union can refer your case to Accomodation Services and assist you in gaining emergency accomodation for a period of time. If you think that you may require this service, please contact the Advocacy Service. Thirdly, show empathy for your fellow students and their lived experience and be an active bystander to ensure they are okay. It’s important to acknowledge and be critical of the ways our society perpetuates stereotypes and sexist behaviours and what we can do to educate ourselves in doing something about it. The campaign asks us to think about how can you help women on campus to feel safe and empowered? How can you encourage men to express their emotions in a healthy way? How can you be an ally of the ‘Be A Better Human’ campaign and be the change we all want to see in our community? First, talk about and engage in ideas surrounding affirmative consent; that it’s voluntary, enthusiastic and continuous. Second, Respect each other; women, men and gender diverse people – their rights, their identity and autonomy. We promote students’ learning by facilitating volunteer opportunities, workshops and citizen science projects with guidance and collaboration with academic staff and land care groups. The society also aims to increase knowledge of the biodiversity of native flora and promote appreciation of its beauty. We hope to achieve this by organising talks, science projects, camps, bush walks and more. Everyone with an interest in plants is welcome to join our Facebook group with the same name. Asian Pop Culture Appreciation Society is a space for those who have a common interest in all things associated with Asian pop culture. Whether your interest is towards K-Pop, J-Pop, V-Pop or even K-dramas/variety shows, we hope to unite members and establish a family where we can experience Asian pop culture without having to step into our TV screens! The La Trobe Card Gamers Club (CGC) is a club dedicated to providing a venue for people to get together to play, trade and generally enjoy playing collectable card and other non-traditional card games. Members enjoy playing a variety of different card games from collectable card gaming to specialty hobby games. All are welcome to attend sessions, get to know new players and talk to our executive members who can help you arrange games outside of the club meeting times and fill you in on upcoming club events. In addition to providing a venue to play in, the CGC also periodically holds ‘Draft’ and ‘Sealed Deck’ style competitions with prizes and giveaways aplenty. So if you’re an old hand at card gaming or just interested to see what this exciting hobby is all about, feel free to rock on down to a meeting and join in the fun! The Botany and Plant Ecology Society of LTU brings together students interested in botany and any aspects of plant ecology, be it agriculture or conservation. Chinese Students Club (CSC) is a group that helps students to get a better understanding about Chinese traditional culture and allows them to be involved in many festivals, activities and events that help to celebrate Chinese culture. By participating in these activities, students at La Trobe will have more knowledge about Chinese culture itself and most importantly they will be able to experience lots of fun in the activities which are beyond their expectations. Also, they would meet and easily make a lot of Chinese friends that come different parts of the country such as China, Malaysia, Taiwan, Hong Kong and also Singapore. in the Melbourne Opera Chorus! We also do social stuff and welcome any suggestions to make being in the choir even more fun. We are also a member of AICSA (www.aicsa.org.au) - an association of 10 university choirs from around the country - and every year the choirs come together in a capital city for a 10-day intervarsity choral festival: basically intense rehearsing, intense socialising, etc, finishing up with an amazing combined concert at the end of each festival. It is definitely a major highlight of our year. Last year LaTUCS co-hosted the 2018 festival with choirs from Monash & RMIT universities. We’ve just returned from this year’s festival in Adelaide, and next year is in Brisbane in July 2020. So come along and have a sing! Any questions, please ask! LTU COGS seeks to create and grow a community for competitive online gaming, with a focus on League of Legends, CS:GO, HotS, and DOTA2. This fosters interaction between LTU students and the wider eSports player base in Victoria. It’s a place to get together and discuss recent eSports events, play a casual game or two, watch competitive tournaments, and participate in tournaments with both new and experienced players. Are you a Harry Potter fan? Whether you have only read the books or seen the movies to fantasising about getting your own wand; or if you just have an uncontrollable urge to talk about Harry Potter all the time (or all of the above).... You have come to the right place! Dumbledore’s Army: La Trobe Division is the Harry Potter fan club on campus for all past and present LTU students/ alumni and faculty members. Running events both off and on campus, there will be multiple chances for you to meet new people; discuss Harry Potter to your heart’s content; and join our magical community in celebrating all things HP. Our events season for 2019 includes: Monthly magical Monday movie nights; Start of Year Feast; Trivia Night; Yule Ball; Games night; Magic camp; and the End of year celebration. ESP is a space for discussing, organising, acting on and spreading awareness of issues surrounding equality, sustainability and peace. Get involved through weekly meetings, stalls, movie screenings, campaigns, fundraising events, workshops, skillshares and more! ESP has been running since 2008 when it evolved from the La Trobe University International Development Students Club. It now encompasses students and others from all disciplines and backgrounds to come together and engage on issues of equality, sustainability and peace. We welcome the involvement of all people who wish to positively and productively engage in various issues surrounding equality, sustainability and peace. We aim to build networks, develop educational activities and engender change by providing information, resources and tools for action, both here and globally. ESP hopes that by spreading awareness and by providing means by which people can become involved in these issues, we can all actively contribute to making the world we live in a better place for us all. at La Trobe University. This will be done in a variety of fun and exciting ways, in which both exchange and La Trobe students will be able to easily mingle and be entertained. We also want to provide a medium for returning or budding La Trobe exchange students to share experiences or discuss what they would like to do. food, music and dance. LUGS hosts several on-campus to treat your taste buds. This includes souvlaki days and frappe days. Furthermore, by working closely with the Greek Department, LUGS successfully hosted an educational seminar which focused on Linear B Tablets in the Mycenaean period and how the Greek language has evolved over time. This was a very successful event and we will continue to promote the Greek language with the Greek Department in the future. In the meantime, we encourage first-year La Trobe students and re-occurring students to become a 2019 LUGS member. By becoming a member, you will have an amazing opportunity to meet new and diverse people, have the chance to change and influence the Greek community but most importantly you do not have to be Greek to join, all we ask from you is your inner Greek spirit and energy. La Trobe students. The only way things can change for the better is if you get involved, so come and get involved! Hakama Nakama is the official Japanese Club of La Trobe University (Bundoora Campus). The goal of the Japanese Culture Club is to inform more people about the Japanese language, society and culture. We actively encourage our members to participate in a range of social and cultural events, as well as events that take place outside of the club. By doing so, we wish to make a friendly environment in which our members can experience and learn more about the different aspects of Japanese culture, as well as enjoying themselves in the company of people with a passion for all things Japanese. The Humanitarian Societyâ&#x20AC;&#x2122;s main purpose is to aid countries and places that are in need of immediate humanitarian aid. We aim to help through raising funds, gathering clothes for donations, supplying sanitary needs and food. Anything that can help! Welcome to the FIRST KNOWN Australian University Based Kyudo Club! As both a student at LaTrobe, and in Kyudo, I would like to welcome our members to the path leading to their own Kyudo journeys. We are hoping to be able to provide a space for Kyudojin - beginners and more experienced alike - to train and grow; especially for our international exchange students from Japan, Taiwan and other countries where Kyudo has been an established Martial Art. The club is open to faculty members as well as students at the university, because a person can NEVER be too old to begin Kyudo! Kyudo is still considered to be very new in Australia, and as such, there are very limited places to train. We are proud to announce that, not only are we the first known Kyudo Club within an Australian University, but we are formally recognised and affiliated with Australiaâ&#x20AC;&#x2122;s own Kyudo Association! Our long-term goal is to increase the practice and education about Kyudo, and to eventually be able to safely demonstrate this art-form during events like O-Week, Japanese festivals and and other cultural events at La Trobe! This club is for all students and staff to learn to dance Salsa and Bachata dancing. We have absolutely FREE beginner dance lessons. Our vision is to help students to enjoy their time on campus, de-stress from workload pressure, meet new people and make friends and contacts, exercise and have FUN! La Trobe Nepalese Student Association (NEPSA) is established with a vision of providing a homely environment to Nepalese students coming to Melbourne. The primary goal of the organization is to provide assistance to Nepalese student with their requirements. We act as a cultural bridge between Nepalese students and students from other countries. We aim to promote and assist Nepalese students in their social and educational activities at the University. The La Trobe Nintendo Society is about everything Nintendo, from Pokemon to Super Smash Bros, and from Mario to the Legend of Zelda. We have meetings at least once a week, either being a Pokemon tournament or some friendly games of Super Smash Bros or Mario Kart. All are more than welcome to come along, have a great time in our relaxed atmosphere and make some new friends. a group of fabulous people wanting to get other fabulous people interested in the art of debating. We have big plans to have lots of debates happening around campus and even off campus. So we really do urge you to come along and see what we are all about and meet some new people. Get involved in social events, debating workshops, competitions and much, much more! Ever wonder which end is the head of a chocolate cornet, or how forming an idol group can save your school? Perhaps Lunasy is the group for you. Proudly celebrating our sweet 16th, The La Trobe University Noble Anime Society is a club dedicated to the love and appreciation of Anime and Manga. Whether youâ&#x20AC;&#x2122;re a protagonist or a side character, this club will be perfect for you. Attend our weekly screening and events and find us on Facebook or the Lunasy website. Oxfam La Trobe was established in 2013 and has grown to become an embraced NGO presence on the Bundoora campus. The club links to Oxfam groups at other universities as well as Oxfam Australia. Oxfam La Trobe is an open and inclusive student group which Organised University Debating (LOUD) welcomes students from all walks of loud@listserv.latrobe.edu.au life. Being a culturally diverse group with a large international student Want to achieve killer self confidence membership gives us a greater range and communication? Become an of ideas and contextual understandings awesome general knowledge badass? which we hope will make our social Super charge your employability? Be a justice events interesting, engaging and master in the art of persuasion? Then meaningful for the La Trobe student weâ&#x20AC;&#x2122;ve got just the club for you! We are community. The Pakistan Students’ Association at La Trobe University is a non-political organization, representing the Pakistani culture through social interactions. The society aimis to promote cross cultural integrity, social ethic, welfare, educational and cultural activities. The association serves as a platform for both newly admitted and existing students to interact with each other, promote goodwill and understanding amongst Australians and Pakistani students. PSALTU is a place for all Pakistanis to meet and get to know each other. We provide assistance for Pakistani Students and organize many activities for students at La Trobe and sometimes collaborate with other Pakistani societies in other universities. We run drug-and-alcohol free social events, and we love to give out free stuff (Did we say free? Yes we did!). Come along and say hi at our O-week booth to grab our free magazine and other great goodies! A few things we do on (and off ) campus include: planetUNI Central our bi-annual Orientation party! Social Hang-outs - Dinner, heading out to the movies, ultimate frisbee, board games night, pizza night, you name it! Prayer Meetings - planetUNI is committed to believing the best for our campus. We like to come together to share life and vision with one another. We hold our events all year around! If you aren’t a member, you can sign up at any of our events (and it’s free!). We can’t wait to meet you! What does the Public Health Students Association do you ask? We basically want to improve the lives of La Trobe students through a health lens. Think safer campuses, health and wellbeing, lifestyle balance (too much uni is never a good thing) affirmative consent etcetera etcetera. Public Health relates to anyone and everyone no matter what you’re studying. We are interested in campus, local and international health issues. If you are passionate about health and wellbeing, love coordinating events, enjoy expanding your networks and want to have fun on the way, our group is for you. Psychology Society The Psychology Society aims to unite the love students share for deepening the understanding of the mind, the self and human behaviour. Throughout the year the events endeavour to provide a space for discussion, investigation and hands-on involvement, to shed light onto what makes humans human. Being part of the Psych community will be an enlightening opportunity for like-minded students to come together to share ideas and further embed and expand our understanding of the human psyche! Join us in 2019 for another action-packed year of interesting and compelling events, which help us to apply what we learn in the classroom to the real world! The Role Playing Group is a group of individuals who all share a passion for role playing. It is a social activity where people get together to collectively tell a story. It combines elements of problem solving, emotional exploration and acting into an enjoyable and stimulating pastime. There are many different types of role playing games that cover all manner of subjects and settings, from fantasy and science fiction to realistic portrayals of the contemporary world. LURG meet once a week to provide a place for groups to play their games as well as giving individuals the opportunity to meet others so they can join in on a game or start a new one. Writing a song? Beginning a band? Mozart in the making? LUSoM connects musically-minded individuals to play, perform and appreciate all styles of music in a supportive environment. Meetings are held twice a week where we socialize, unwind and play our instruments in a group setting. We promote performance opportunities throughout the year to anyone looking to expand their performance skills. Finally, our aim is to connect students with the networks and support they need to keep doing what they love. We welcome all instruments, ages and abilities so if you want to come and have a jam with some fellow students then this is the place for you! Sri Lankan Students Association slsa@listserv.latrobe.edu.au Situated nearly quarter a globe away from La Trobe, Sri Lanka is a small island nation which is often referred to as the “pearl of the Indian ocean”. Also known by the historic names “Ceylon” and “Taprobane”, this beautiful country is home to about 20 million people from various ethnic and religious backgrounds. With a documented history spanning over 2500 years, Sri Lanka has a rich Buddhist heritage which has been passed down over the generations. This island nation is also well known for its cricket, a sport followed by Sri Lankans with unequalled passion. But an introduction to Sri Lanka isn’t complete if one doesn’t mention about its world heritage sites, golden beaches, pristine natural beauty, colourful festivals, wildlife and warm hospitality which attracts thousands of tourists throughout the year. Our main scope is to look after well being of the members of the association and to share information about Sri Lanka and the Sri Lankan culture. We also aim to extend our membership beyond the members of Sri Lankan community by increasing the diversity of our membership and interacting with other student associations in Australia. wasted) food from all major vendors on campus. The food goes to local churches that hold community lunches and dinners each week. Our team has saved over 2 tonnes of food in the past 2 years and we would love for you to be a volunteer. Volunteering hours are up to you! Whether it be one or two days a week, volunteer hours start after 5pm and this is an opportunity to be a leader and be a part of change. See you in 2019 La Trobians! without it now. The good thing about our Agora is that we’ve got a variety of cuisines on offer for students who’ve got different tastes and also dietary requirements. And being in Melbourne, which you can call the heaven of cafés, has got me hooked onto its coffee. We’ve got our Agora and the entire city flooded with some beautiful cafes. Try some of ‘em in Lygon Street when you find time. Well, it’s always a jolly good ride, until you ram into something. I was under a little bit of financial stress for a while, which sent my plans to go to NZ last summer, rolling down the hill. During this time, I made sure that I sought advice from some of my sensible friends who helped me out. Thankfully, I found a casual job that helped me to support my expenses and in due course of time, I was able to tide over the crisis. And then came my encounter with the LTSU. I had just known this as a student representative body, which provides free food on certain days. But when I started volunteering in their activities and chatting with the Office Bearers, I realised that they were present in mainstream services, such as advocacy, emergency accommodation, financial counselling and scholarships as well. Moreover, it’s a great opportunity to make friends and get involved in activities. Traveling, is one amazing activity, which I always love to do. So I made it a point to travel whenever I could find time, a set of friends and some money. There are many more experiences in these one and a half years that have changed the way I think and look at things, which I would love to share in this write up. But the patience of the readers has to be respected. I don’t want to give you any advice before I conclude this. But just a request to consider this life in LTU and Melbourne as an opportunity to develop and better yourself. So, to all of them reading this, Wominjeka! Walk in with a big smile on your face. A MOZZA-HELLA GOOD SANDWICH Donâ&#x20AC;&#x2122;t knock it til you try it. 4 slices of thick sourdough bread 25 grams each grated Parmesan, Gouda, Gruyere, Mozzarella cheese 1 teaspoon onion powder 1 teaspoon smoked paprika 1 teaspoon garlic powder 1 teaspoon mustard powder 1 teaspoon Cayenne pepper cracked pepper to taste 1 tablespoon mayonnaise 1 tablespoon Dijon mustard plenty of butter tomato relish / your favourite hot sauce Recipe Grate all of your cheeses into a bowl, and blend together with onion powder, smoked paprika, garlic powder, mustard powder, and cayenne pepper. Season with cracked pepper to taste. Using a grill and plenty of butter, cook one side of your bread slices. Leave the other side uncooked. After one side of each piece is cooked, remove from heat. On the cooked sides of the bread, spread one piece with the mayonnaise and the other with the mustard. Top the spreaded side of the bread with your cheese/ spice blend, and close the sandwich with the other slice, leaving the condiments facing inwards, and the uncooked side of the bread facing outwards. Butter the grill, andfeature bring to a moderate heat. Once hot, place your sandwich onto the grill, and ensure that the butter covers the slice. Cook for four minutes on each side, flipping to check that both sides are cooked well. Once cooked, remove from heat and slice diagonally. Serve with your favourite chutney, relish or hot sauce. hen diving into the world of grilled cheese sandwiches, having a slice of swiss between two buttered pieces of white bread is just never enough. In fact, it’s heresy. There are so many options of cheeses, breads and meats available, and with the right choices, simplicity can still be preserved whilst creating a unique and memorable taste for your buds to enjoy. are several different styles of cheese to consider. Culinary figures, such as Matty Matheson, call for a mixture of fancy Ontario Cheddar and the not-so-fancy processed slices you had during primary school lunches, whilst others simply call for a mix of cheddar, swiss and parmesan; the things you’d normally find in your pantry. Overall, just choose two or three cheeses that you like best, and grate them all into a bowl. Boom. Bread - What else is supposed to keep this s**t together? To keep it all together and to give it that signature crunch, a decent style of bread is highly necessary to keep all that gooey liquid gold together. There is constant battle between the two main styles of choice; a signature crunchy sourdough or a soft and floury rustic white bread. It all comes down to the individual opinion, but ultimately, it’s the sourdough that comes out on top. If you’re going to go boujee on the cheese, why not go boujee on the bread? Final note too; diagonal slices always taste better. Condiments - Why not make this thing a bit more interesting? To finalise that wonderful taste, you’re going to need some nice accompaniments to go with your sandwich. Some use onions, pickles, tomatoes and fancy relishes, others call for a simple touch of mayonnaise or a delicious rustic mustard. The common consensus seems to be that mayonnaise is necessary for a good taste, but that’s just something I tend to enjoy. After my rigorous studies of this very important artform, I believe that I’ve come up with the perfect recipe for the most delicious croque monsieur you’ll ever have. the arcaDEm Here are a few bits and pieces for your enjoyment. Or procrastination. Find all the answers in our next edition. Share your art to @rabelais.magazine on Instagram. guess this How many tickles does it take to make an Octopus laugh? COUNSELLING Our experienced counsellors can help with problems that affect your studies and personal life. The service can also provide specialist support to LGBTIQA+ students and Indigenous students. DISABILITY SUPPORT Do you have a disability, medical condition or mental health illness? You can talk with a Disability Advisor to find out about the supports available and get advice about how to manage your studies. EQUITY & DIVERSITY Support for students with a disability, eligible students experiencing financial or educational disadvantage and students from a refugee background. support group (Queer Chat) and many other services and supports for our LGBTIQA+ students. We also provide training for staff and students on understanding LGBTIQA+ experiences. CHAPLAINCY We have a multifaith chaplaincy service on campus which supports the expression of diverse religious and faith traditions. The chaplaincy service also hosts a number of events, which can help you make the most of university life, meet new people and explore your faith or spirituality. You love alcohol and enjoy a night out every second day- but how can you embrace your love for liquor and still be a decent and respectable mate to your drinking buddies and always keep safe?